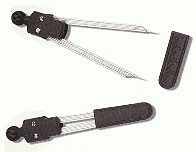 Aluminum alloy precision made instrument -- USA made from start to finish -- with 5 necessary tools for neurological examination. 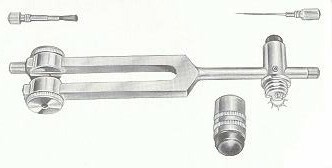 This instrument has a built in Buck-type reflex hammer, a tuning fork hand tuned to 128 cycles per second with rounded weights on its ends (a C256 fork version is also available), a pin, a brush and a neuro-pinwheel in ONE TOOL. Fine aluminum alloy. If you need one instrument to do it all, this is it. See webstore for more details and a bigger picture. Click Here for the 256 Hz version of this.